Roasted courgettes caramelised around the edges and sweet cherry tomatoes sautéed in garlic and olive oil - a fantastic combination. Preheat the oven to 230°C, gas mark 8. Spread out the courgette slices in a large roasting tin and toss with 1 tbsp olive oil. Roast for 12-15 minutes or until tender and golden. Take the courgettes out of the oven and preheat the grill to high. Meanwhile, crack the eggs into a bowl, season and beat in the grated cheese and lemon thyme. Stir the courgettes into the egg mixture. Pour 1 tbsp olive oil into a 25cm non-stick frying pan with an ovenproof handle, place over a high heat and add the egg mixture. Cook until puffed up around the edges, then turn the heat to low and cook for 10-12 minutes until the frittata has set around the edges but not on top. Place under the preheated grill and cook for 3-4 minutes until the top is set. Remove from the grill and allow the frittata to stand for a few minutes before transferring to a flat plate or board and cutting into 4 wedges. Meanwhile, place the cherry tomatoes, garlic, 2 tbsp olive oil in a small saucepan and season. Place over a medium heat and warm through gently for 5 minutes until the tomatoes have softened and released their juice. 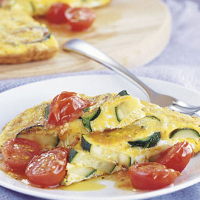 Serve a wedge of the frittata with a spoonful of warm tomato sauce.